804-1220-02, 804-1240-02, 804-1260-02, 804-2410, 804-2420 and 804-2430. Please use remote panel (part# 808-8040-00) for 804-1220, 804-1240 and 804-1260. The TRUECHARGE 2 Remote Panel is designed for use with TRUECHARGE 2 Battery Chargers. This full-function remote allows you to monitor and control battery charger performance from a remote location, including features not accessible from the charger’s onboard display. 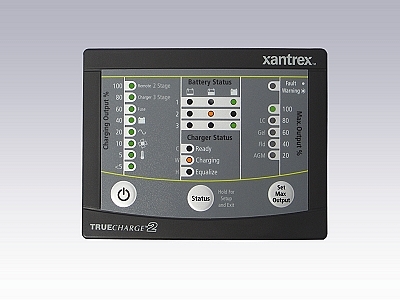 The TRUECHARGE 2 Remote Panel reads like a fuel gauge and displays critical information on charging of battery banks. It is very easy to install, read and operate, connecting with the battery charger through the included telephone cable.